xt:Commerce NEXT is a Germany-based progressive SaaS version of xt:Commerce open-source shopping cart. It is designed for a fast and effortless entering to the e-Commerce market and offers a comprehensive, out-of-the-box functionality to meet the highest requirements of a modern online retail business. 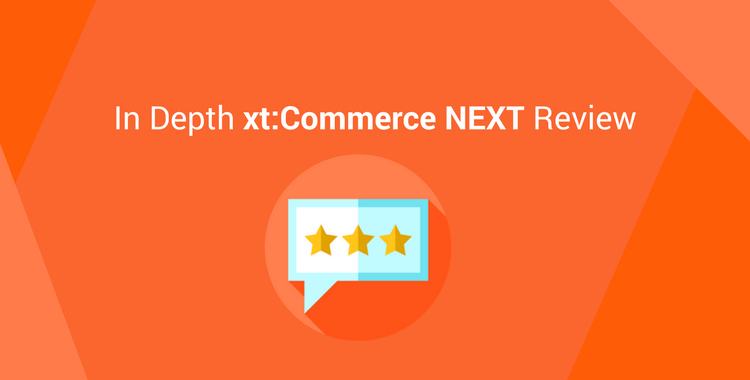 In our xt:Commerce NEXT review we will define what features you can benefit from using this shopping cart. With xt:Commerce NEXT you can apply your creativity to the full scale and make a unique design or extensively customize existing layouts with a handy drop-and-drag tool. You are also suggested to choose from a wide selection of premade stylish templates to give your shop a premium look in a few clicks. NEXT e-Commerce solution holds a key focus on users and secures excellent cross-device experience. It adapts easily to every kind of screen including mobile devices, laptops, tablets, PC, TV or even game console. What is more, responsiveness became one of the central xt:Commerce NEXT features for efficient store management as well. Store owners can effortlessly access admin panel from a smartphone and have a grip over their shop anytime and anywhere. Similarly to the other modern shopping carts, NEXT pays a great attention to the SEO turning it to its key advantage. Right out-of-the-box users can enjoy a number of built-in mechanisms to reach top search engine positions for their stores. Of course, the platform doesn’t omit marketing features as well. Due to a wide range of marketing tools, there is no need to buy and install various add-ons and extra modules. It not only saves you money but substantially economizes your time. There are wonderful options to give special offers, discounts, send coupons or initiate full-scale loyalty and rewarding programs to boost your conversion rates and keep customers happy. NEXT also lets you start a blog and provide valuable content, which is an excellent strategy to intensify organic traffic to your website and attract new visitors. A performance of your store can be measured and displayed due to an advanced built-in tool in the admin dashboard. To gain better control over your e-Commerce activity and get more detailed reports and stats use integration with Google Analytics. It helps to track the number of transactions, generated revenue and other KPI's to identify the most efficient marketing campaigns and form successful strategies for your business. Since xt:Commerce NEXT is a SaaS platform it can boast all the benefits of hosted solution like quick setup without extra spendings and low maintenance costs since fees for hosting are included as part of monthly plan payments. Moreover, there is no more necessity to perform a tedious and technically demanding task of server and website administration. xt:Commerce NEXT takes care of backups and software updates, thus it entirely eliminates risks of losing valuable data, provides successful upgrades and saves you a handful of time. You are also provided with 24/7 reliable tech support to help you in case any questions arise. Retailers are free to choose from 3 available pricing plans: Silver, Platinum and Diamond. As it was mentioned above, all of them already include hosting and installation expenses. The least expensive pricing plan starts from 39 EUR per month and oriented at small online stores. It imposes a limitation of 500 products (SKUs) and supports only 1 admin profile and 1 currency. A more pricey plan will cost you 79 EUR per month, but a much bigger number of products -- up to 5000 can be sold. In addition, you will be able to manage 2 admin accounts and use 2 currencies. Diamond is the most expensive plan with 179 EUR monthly fees. It supports up to 20000 products, and let you create 5 admin profiles and operate 5 currencies. This plan is a perfect option for mid/big-sized global retailers. All three of them allow unlimited product categories, adding videos and pictures and selling digital products option. They also offer equal powerful marketing tools like discounts, gift certificates, bonus points programs as well as possibilities to send newsletters and run a blog that enables you to play successfully within e-Commerce market and gain advantage over competitors. Limited product number for every price plan. Moderate range of extra modules and application available. Restricted customization possibilities caused by the nature of SaaS platforms. All in all xt:Commerce NEXT is an advanced Shopping cart capable of competing with the leaders of cloud-based solutions market. If you willing to power your online business with this progressive platform, Cart2Cart offers you an automated migration to xt:Commerce NEXT from 75+ popular shopping carts. Cart2Cart lets you transfer all the valuable data like products, categories, customers, orders, manufacturers and other entities in a smooth and fast way with no programming skills required. Launch an absolutely Free Demo Migration that will take you up to 30 minutes and provide you with the possibility to test the service in action.